Here's your strategy to take advantage of today's dropping interest rates. Over the past month, mortgage rates have plunged dramatically lower, reaching levels not seen since Nov. 22, 2012, when the conventional 30-year fixed rate hit an all-time low of 3.31%. For homebuyers and refinancers, this is a welcome change. However, the forces driving rates down today are based on serious concerns about the global economy. Read on to learn why rates are plunging, what could drive them even lower, and how investors should react. The low rates today have emerged from a much different macroeconomic context than in the aftermath of the financial crisis. In 2012, the Fed was rapidly expanding its balance sheet with purchases of Treasuries and mortgage-backed securities, actively forcing rates lower. Today, the Fed is no longer making those purchases and is instead working to unwind its near-zero interest rate policies put in place following the financial crisis. Without the Fed actively pushing rates lower with asset purchases, I think it is unlikely that mortgage rates will fall much farther than they already have. In 2012, the Fed's buying was able to significantly raise prices -- and therefore lower yields. Absent that force pushing the balance of supply and demand, today's near-historic low rates are likely temporary. The 10-year Treasury yield -- a common harbinger for changes in mortgage rates -- has supported that theory as rates have moved lower. Twice in the last month, the 10-year has approached its lows from 2012 and both times the market has quickly sent its yield back higher. 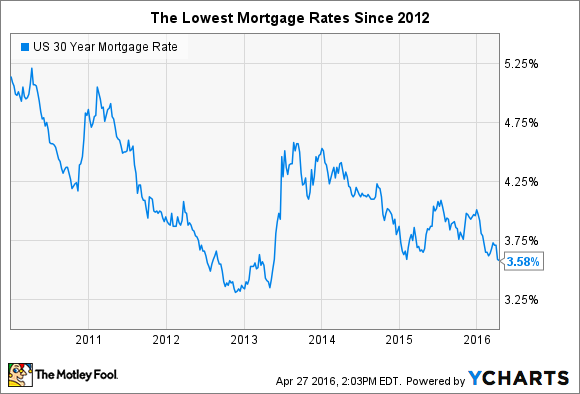 Had the 10-year continue to sink below those 2012 lows, then it would be much more likely that mortgage rates would follow suit. If it's not the Fed, then why are rates dropping again? If it isn't the Fed tipping the scales of supply and demand, what would it take for rates to drop to a new low? The most likely driver of such a drop would be a global event causing a scare in the markets. In other words, it's market psychology as much as it's hard economics. If such an event were to occur, the markets would likely price in the chance that central banks would increase or prolong easy-money policies in response to a slowdown. That would push rates lower in the same way as 2012. What could such an event look like? It could be in the form of a deterioration in the U.S. labor market or GDP. It could be spurred by bad news out of China, much like the market experienced in Aug. 2015 and Jan. 2016. 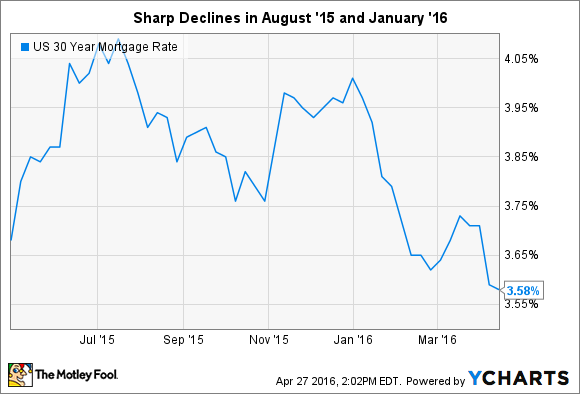 In both of those cases, mortgage rates dropped sharply and immediately as fear rippled through the market. Or, more tangibly, it could be sparked by the U.K. referendum to potentially leave the eurozone, scheduled for a vote on June 23. If the U.K. votes to exit, economists predict that rates could fall some more over fears of negative economic repercussions impacting Europe and the U.S.
To me, the best way to figure out the optimal plan for investors is to understand what happened the last time rates were this low and then determine how today's economics could change the outcome. In the years immediately following the financial crisis, low interest rates spurred a refinancing boom to the benefit of banks around the country. Leading mortgage lenders like Wells Fargo and Bank of America relied on the fees and loan volume from this surge to offset weaknesses in commercial real estate, legacy mortgage assets, and tumultuous trading in the markets. It also helped to generate the capital needed to pay the billions of dollars in fines and settlements levied for misconduct that led to the crisis. On the other side of the coin, builders like Toll Brothers (NYSE:TOL) suffered through the refinancing boom, as low rates did little to drive new home sales. Toll Brothers' 2012 annual revenue was about two-thirds below its peak in 2007, a drop of more than $4 billion. The company's revenue has since doubled from that level, but even still remains well below the 2007 highs. Low rates today should help to spur higher real estate activity and lending as they did in 2012. However, this activity today is based on much more stable overall real estate market. Home purchases are increasingly driving the market, rather than the refinances that characterized the market in 2012. 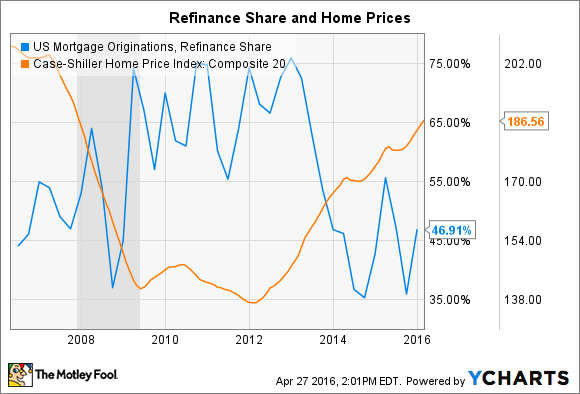 It's no coincidence that home price increases have coincided with the decreased share of refinancing. U.S. Mortgage Originations, Refinance Share data by YCharts. For Bank of America, Wells Fargo, and other lenders, this means that today's low rates could be doubly as potent toward their consumer and home loan businesses pushing both purchase money and refinance loans higher at the same time. Driven by its mortgage business, Wells Fargo was the only mega bank to increase its revenues in the first quarter, and Bank of America's consumer banking unit saw its profits jump $324 million, 22.2%, compared to the 2015 first quarter. I think these improvements are just the start if rates stay low or decrease further. Economic data supports the opportunity. Mortgage applications so far in April are up over 13% compared to the same time in 2015. Housing starts are up 31% over the same period, along with 17.5% and 18.5% jumps in completed homes and under construction homes, respectively. Toll Brothers is also poised for fundamental improvements, even if the stock market has yet to recognize the potential. The stock is down over 21% in the last 12 months, compared to the S&P 500's 1.2% drop. And yet, Toll Brothers management is predicting 2016 revenue to grow about 25% annually along with solid growth in efficiency and profits. Bob Toll, the company's executive chairman, told investors on the first-quarter conference call that "the stock market seems to be pricing in a steep decline in the economy, and along with it, our sector. We, on the other hand, are seeing signs that reflect strength and positive momentum in our business based on six consecutive quarters of year-over-year contract growth in both units and dollars." It is, of course, in Toll's self-interest to promote the stock as an investment, but to me, the numbers support his position. If some unknown event does spur economic problems and spook the market, I think that the market's volatility would be a reasonable buying opportunity for the stock of a lender or builder that stands to benefit from low rates driving new sales in the domestic real estate market in the U.S. The key is to not panic, stay focused on quality companies, and, as always, wait for the market to offer you a chance to buy at a discount.